There are insulation contractors in just about every community. There are also general and remodeling contractors who are interested in installing insulation for their customers. With so many contractors to choose from, how do you make sure you’ve got the right one? That’s a good question. Here are some tips that will help you find the right insulation contractor and feel confident about the work they do. Insulation plays a major role in a home’s energy performance, but there are numerous other factors that also determine your monthly utility costs. If you haven’t had an energy audit performed on your house, this affordably priced whole-house assessment is a good investment. It provides a valuable overview of how your home uses and loses energy. A home energy audit will tell you not just about insulation levels, but also about the efficiency of your HVAC system, water heater, appliances, lighting, and windows. The audit will identify the weak points in your home’s energy performance, thereby highlighting the best opportunities for energy-saving upgrades. 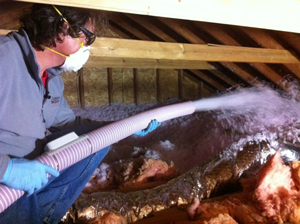 Most houses have too many air leaks and too little insulation. It’s a fairly sure bet that an energy audit will identify air sealing and additional insulation as recommended improvements. But it’s important to keep in mind that no single type of insulation is suitable for all applications. The most conscientious insulation contractors make sure to match the type of insulation to the application. For example, rigid foam insulation is excellent for insulating basement or crawl space walls, while blown fiberglass or cellulose insulation performs well in unfinished attics. Look for a full-service insulation contractor who has the capability to install a wide range of insulation types. "Fluffy" insulation materials like fiberglass batts, cellulose and loose-fill fiberglass won’t work well to stop energy losses unless the spaces where they’re installed are also air-sealed. An experienced insulation contractor is likely to insist on air-sealing to stop energy leaks prior to installing this type of insulation. The air-sealing process involves using different materials (spray foam, plywood, sheet metal and caulk) to fill gaps and cracks where conditioned air leaks out of the house and unconditioned exterior air leaks in. NOTE: Unlike fiber-base insulation, rigid foam insulation and spray foam insulation provide air sealing and insulation in a single step. We proudly offer insulation in New Haven, Hartford, Bridgeport, and nearby areas such as Waterbury, Stamford, Danbury, Norwalk, West Hartford, Bristol, New Britain. Call 1-888-370-6924 or contact us online to schedule a Free Estimate.